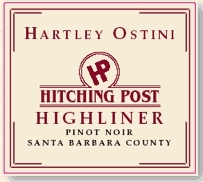 Hitching Post Hartley-Ostini Frank Ostini a chef, and Gray Hartley, a fisherman, make handcrafted Pinot Noirs from vineyards in Santa Maria Valley and Santa Rita Hills. The Sideways movie really put this label in the limelight but these two nice guys deserve all the notoriety they receive and the quality of their Pinot Noirs justify the publicity. 4,700 cases are produced annually at Terravant Wine Company in Buellton. The wines enjoy good retail distribution and may also be purchased at Terravant and the Hitching Post II Restaurant in Buellton.